Man has a triune nature-spirit, soul, and body. God reaches into the very existence of each human on all three levels. True religion deals with things of the spirit, but it overlaps with the soul in the learning of scripture in the mind and impacts the emotions. The flesh is directly impacted by the spirit in terms of the healing and sustaining power of God. Spirit tends to be associated with religion. Philosophy tends to correlate with the the soul (mind/emotions), and science with the flesh and other physical matter. Each overlaps the other as well. It is a fundamental religio/philosophical issue in the creation/evolution debate as to which view of origins one accepts. Are the principles of nature self organizing in of themselves, or did a Creator put them into place? Science will never be able to definitively determine this-contrary to what so many propound. This will be discussed in the articles below. The concepts of religion, philosophy, and science and the interfacing of each domain in the developing of one's world view will be explored. As well, this is discussed to some degree in the booklet: "Defending the Faith in the Last Days" which is now available for purchase. It is 120 pages long.See links below. Sean McDowell presented an article on 2/6/09. He stated, "Last night I attended a debate at Biola University on the question of whether a Christian can be a Darwinist. Karl Giberson (author of Saving Darwin) argued that the evidence for evolution is 'overwhelming,' that i(t) has theological advantages...Theologically speaking, Giberson argued that evolution helps get God off the hook for the problem of bad design (evil), because bad design emerges indirectly from processes of nature rather than directly by God....Giberson favorably cited new atheist Daniel Dennett who coined the term 'universal acid' when describing the consequences of evolution. 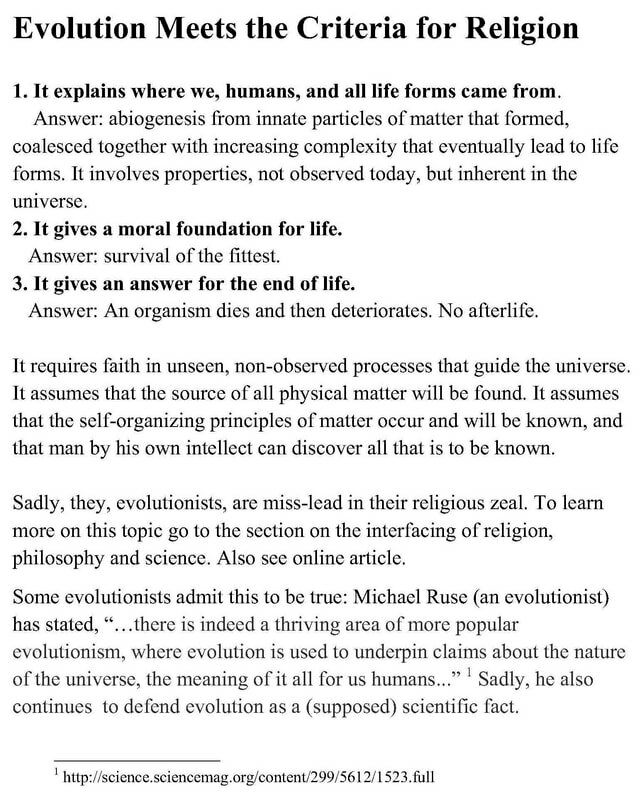 In other words, if evolution is true, then everything about the world needs to be rethought. Thus, according to Giberson, Christian theology needs to adapt to evolutionary theory (not the other way around)...The debate about Darwinian evolution is not going to end any time soon. If the evidence was really compelling, the church would have found a way to wed it to Christian theology by now...But the evidence is just not there. I have the audacity to hope that during my lifetime the truth about Darwinian evolution will emerge." My response, supporting McDowell's view, is in the letter below. I appreciate Sean McDowell's comments in Can a Christian Be a Darwinist? I can say as a Christian and a scientist (for almost 30 years), "that the evidence for 'evolution' " is not overwhelming. In fact I believe that testing evolution (the macro type), in the laboratory, actually falsifies it- proves it not to be a fact . Jerry Bergman has listed over 2,000 scientists, and estimates that the actual number is about 10,000 who are skeptical of Darwinism. This list can be found on the internet. As well, I agree with comments that whether one agrees with Darwin or not does not define a Christian. Belief in Christ's atoning death, accepting His forgiveness, and choosing to follow Him and His principles defines a Christian. But I can say that evolution has been and is used as a stick in which to ridicule and deny any sort of Creator, and in particular the concept of sin and the need of a savior. Many university students, including Christians, have been forced to be indoctrinated with the evolution ideology (not a theory- as it is falsified) to receive their higher education degrees. Jesus said, "By their fruits you shall know them", and I believe the fruit of evolution ideology is a bad fruit. I encourage students to stand strong in their faith in God as the Creator, Lawgiver, Redeemer/Savior, and soon coming King. Defending The Faith In the Last Days.